This fluffer is a multi-purpose one, and can fluff new cotton, old quilt cover, rag cuttings, sweater, woolen yarn, silk floss, camel’s down, wool, etc. 6MTB80－97dynamic cotton fluffer is light, handy, beautiful, sturdy and durable. It is simple in maintenance, with high-quality cotton fluffing. It is equipped with fan and de-dusting systems to improve environmental sanitation on the working site. 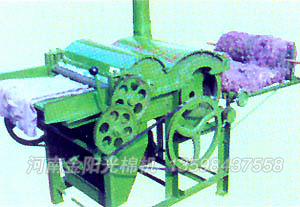 Besides fluffing cotton, it can process old cotton, sweater, wool yarn, rag cuttings, silk cotton, camel’s down, wool, etc. 5.Matching motor: 3KW or 4KW.